Wendi, of Bon Appetit Hon, has been doing a regular "Flashback Friday" post and I am so stealing her idea. Every Friday (that is, if I remember) I'm going to post something from the archives, most likely a post I enjoyed reading but that didn't get much love from my readers. Maybe because I didn't have any back then. Heh. This week, my thoughts on celebrity chefs, from waaaay back on August 17th, 2005, my third post ever on MinxEats. As a foodie, I am pleased that chefs can now become celebrities. Why should actors with nice abs but negligible talent and whorish heiresses get all of the limelight? 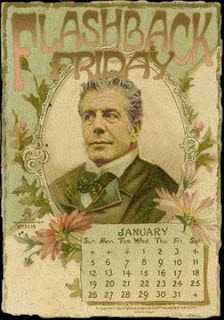 Despite the trend in Hollywood, any old cook with a pretty face shouldn't become a Celebrity Chef. I believe a chef should be the equivalent of a culinary Picasso - well-versed in many techniques and styles, but perhaps perferring one or two over all others. An Artist. The celebrity should be worth oohing and ahhing over. He or she should be the creator of masterpieces that everyone strives to own - or to be able to replicate oneself. Unfortunately, like in Hollywood, some Chefs are now famous for merely being famous. Take Emeril, for example. I'm sure he was a fine chef in his day, back when he still worked in a restaurant kitchen. Now, he comically fumbles his way around a set, preparing recipes created, prepped, and all-but-completed by Food Network staff. Half the things that come out of his mouth are either pronounced incorrectly or are just plain wrong. And the slop he dishes out is ludicrous. But he still has his adoring fans. Go figure. I've eaten in three of his restaurants. One was very good, one was pretty good, and one, his flagship, sucked. Message to Mr. Lagasse: just because you're a big star now, you still need to remember that consistency is important. Your name is over the door, so don't blame your chefs and line cooks for the completely oversalted mess we ate. Have you heard of quality control? Bobby Flay is another celebrity chef who is a tad overexposed. But hey - I think the man still takes cooking seriously. I've eaten at Mesa Grill, and it was one of the best restaurant meals I've had in my life. And watching him cook on Iron Chef America makes me drool. He turns out some seriously yummy-looking stuff in that frantic hour. I'm curious to try out his new restaurant venture, Bar Americain. Mario Batali is another chef who I'd let cook for me anytime. The pasta tasting menu at Babbo was magnificent. Then there's the sad story of Rocco DiSpirito. Young, handsome, and talented, he thought he could rocket to superstardom via a reality show. The cruel reality was that it portrayed him to be a egotistical, lazy, lying, prick. Not only did his restaurant Rocco fail miserably, but he also got ousted from the highly-acclaimed Union Pacific (it was a mutual decision...riiighhht...) which closed abruptly soon after. Despite receiving a James Beard award for his cookbook, Flavor, the man is a laughingstock. Tony Bourdain, another celebrity chef perhaps more famous for his writings than his cooking, made a particularly nasty jab at him on the debut episode of his new Travel Channel show, No Reservations (a must-see). Poor Rocco now has to peddle his Mama's meatballs on QVC to make a buck. So where am I going with my rant here? Well, let me tell you. I have a design client who is a local chef. He once owned restaurants, and got some acclaim. He's now still in the business, still calling himself chef, but I'm not feeling any foodlove from the guy. Perhaps he's been doing church supper-style catering for so long, he forgot how to cook? His collection of recipes seem to have been lifted directly out of a 60s copy of Betty Crocker - crab imperial, salmon in "champagne sauce" - there's no life in them, no spark, nothing new. And the one dish I've tasted that he prepared, chicken pieces in a sauce with pineapple chunks, tasted of dishwashing liquid, and wouldn't have been out of place at the Old Country Buffet. The funny thing is, he still thinks he's got what it takes to be a celebrity chef. Ok, so the guy was handsome in his youth, and had done some modeling. But even the Hollywood vapid wouldn't be impressed by his repertoire. Baltimore is becoming a town full of interesting restaurants, thanks to chefs like Cindy Wolf (although I must comment here that she reduces her stocks a bit too much...cow bones become glue eventually, and sticky lips are not pleasant) and restaurateurs like Steve DeCastro. Let's continue to aim high, shall we? But lets not let sheer celebrity get in the way of talent. Minx, glad I inspired some Flashback Friday love. I do think it's a nice way to shine the spotlight on older posts that get buried in the archives. Despite what's happened over the last 5 years in the food world, a lot hasn't changed. It's still right on.